Leeds, UK, 4th March 2019 – At BigChange we believe in the power of collaboration, which is why we have launched the BigChange Collaboration Network. 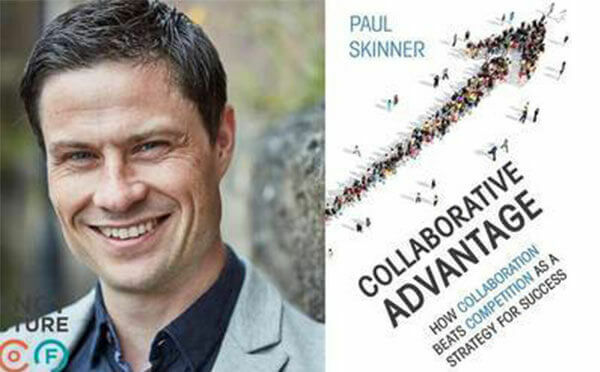 To commemorate the launch of the network, we’ve teamed up with Collaboration Expert and author Paul Skinner whose new book “Collaborative Advantage” questions how collaboration can beat competition as a strategy for success. We asked Paul why he wrote his book and for his thoughts on the importance of collaboration for our clients. Plus we have 10 signed copies of his book to give away (see details at the end of the article). BigChange: What if the most important thing you had to do to grow your business this year was not to compete but to collaborate? Paul Skinner: We tend to think of competition and cooperation as equal and opposite. They are however certainly not equal. Cooperation is a bigger idea than competition because when we compete we are using our own resources, but when we cooperate we can access the relatively unlimited resources that lie outside the bounds of our particular business. And they are not opposites either: competition can itself be seen as a particular form of cooperation in which we agree to play the same game. And of course, in business, we rarely want to play the same game as other firms. The greatest value is unlocked when we bring something to market so unique it makes the notion of competition irrelevant. In today’s environment, one thing I propose we can’t afford to do is to step back in our capacity to cooperate. We frequently face such uncertainty that we can only really cope when we forge common purpose with others addressing similar challenges to ourselves. We can only optimise productivity by learning more quickly from the world outside the business as well as across teams, functions and territories inside the business. The percentage of the world’s knowledge that any of us can hold inside our own mind is diminishing by the second and we are each affected every day in ways we don’t know, by actions we can’t see and by technologies none of us can individually fully understand, so we need to get better at working with others. And with the potential for a further global downturn on the horizon, while every CEO wants to achieve more, many CFOs would still like us to spend less, so we need to get better at making better use of shared resources, avoiding the duplication of efforts and unlocking the fullest value of every investment. How can we grow our businesses more quickly, by better accessing the resource, energy, and influence of all our stakeholders? How can we better address social challenges by more strongly harnessing our collective agency and in particular by better enabling the groups we wish to support to actively help themselves? What kinds of methods and techniques can help leaders to better mobilise around shared purpose across and beyond the business? The winning formula for business today has to be less the ‘survival of the fittest’ than the ‘survival of the friendliest’; less through the creation of Competitive Advantage and more through the creation of Collaborative Advantage. In transport, new forms of cooperation could make the difference in the years ahead between increasing gridlock or a phase transition towards digitally enabled greener modes of more efficient travel. In construction and maintenance, this could mean the difference between today’s flat-lining productivity and the application of breakthrough technology in the hands of a safer, smarter workforce. In mobile workforce management, it could mean the difference between staff who are disconnected and disempowered and the acceleration that comes from remote teams empowered to learn and work as one. Through my advisory firm the Agency of the Future and my social enterprise Pimp My Cause, I have been involved in creating Collaborative Advantage for everything from entrepreneurial ventures to some of the biggest businesses in the world as well as across a diverse range of social and environmental issues from how to better adapt to the needs and capabilities of ageing populations to how to tackle climate change. One thing these experiences have convinced me of more than ever is that the best answers lie in the spaces between us. What could you achieve with more of the world’s available support on your side? For your signed copy, please like our page on social media and share this link and you will be automatically entered. If you’d like to build your own Collaborative Advantage, consider using our platform the BigChange Collaboration Network to seamlessly allocate and manage jobs through external partners, bringing scale within access to the touch of a screen.